From Beirut take the coastal highway south for about 20 km to Damour. From there take the road to Beiteddine which passes through the village of Kfarhim. From Kfarhim you have the choice of taking the southern route through Baaqline (a right turn at the fountain) or the northern route through Deir El Qamar (continuing straight past the fountain). Both roads meet at Maasser Beiteddine. 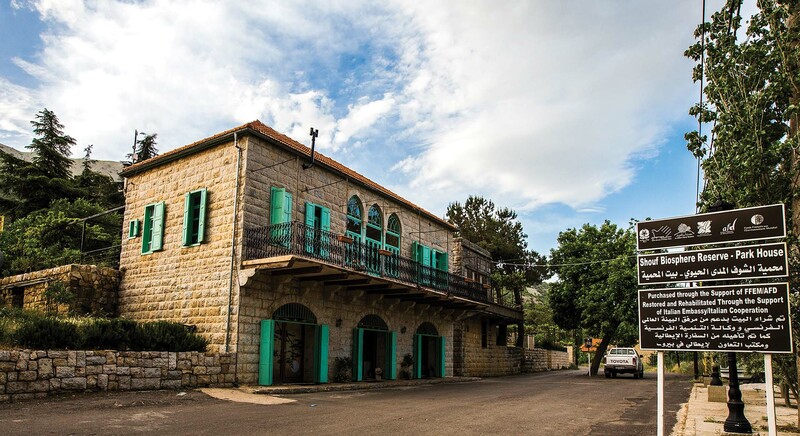 the coastal town of Damour it takes about 30 to 45 minutes to reach the Park House of the Shouf Biosphere Reserve in the village of Maasser el Shouf. In case you want to go to the Niha Fort/Shqif Tyron keep going straight through Moukhtara to Amatour, and eventually to Niha. A second route to the Shouf Biosphere Reserve from Beirut is via the Damascus highway east to Aley (about 20 km). After Aley continue past the villages of Bhamdoun and Sowfar to Mdayrej where you make a right turn off the Damascus highway and head towards Ain Zhalta (14 km from Mdayrej). Then to the gate of Ain Zhalta-Bmohray. It takes approximately 30-35 minutes to reach the Shouf Biosphere Reserve from Aley. A third route to the Shouf Biosphere Reserve is from Kefraya in the Bekaa Valley. From the main Kefraya intersection take the road west over the mountains to the Maasser el Shouf cedar forest entrance (about 14 km from Kefraya). From Maasser el Shouf you can take the road to Moukhtara and then to Niha Fort/Shqif Tayroun entrance (15 km from Moukhtara) or you can take the road that passes through the Dalboun oak forest to Barouk and on to the Barouk Cedar entrance. lead you to the Eco building and to Tawlet Ammiq. 25 km to the Niha Fort/Shqif Tayroun entrance. The easiet way to reach the reserve by public transportation from Beirut from Cola station where there are buses and mini-buses almost every hour starting from 9 AM to 5 PM. All the buses reach Jdaideh/Baakaata where taxis can be hired to any of the entrances and villages. Some of the buses from Cola reach Barouk, and Niha as well as Khreibeh and Baadarane.